March Middleton is a young woman in Victorian England who must make her own way in the world after the death of her father. Luckily for her, she has a godfather who is willing to take her in and provide her with a home. This is all she knows when she turns up on the doorstep of one Mr. Sidney Grice in The Mangle Street Murders. It's probably just as well she didn't know much about her guardian, because he turns out to be a fairly unsympathetic character. He's pompous, judgmental and never makes mistakes. He is also London's most well-known private detective. When March joins his household, it isn't long before a woman appears asking for help. Her daughter has been murdered, and she is certain her son-in-law (arrested soon after the discovery of the body) is innocent. She tells Grice the facts of the case. Her daughter was stabbed to death inside the shop she ran with her husband on Mangle Street. The husband was asleep in the next room, but heard nothing of the struggle. To make matters worse, the police can find no evidence of a robbery. Grice listens to the evidence and announces that he will investigate, but he tells Mrs. Dillinger that his services are expensive. Because she is a widow, Grice asks how she intends to pay his bill. She cannot pay and leaves in a distressed state, but March, having been moved by her plight, asks Grice to investigate the crime. She offers the mining shares she inherited from her father as payment. She does, however, impose one condition -- she wants to accompany Grice on his investigations as his assistant. 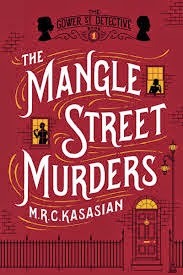 He accepts her offer and they begin the investigation of the most recent murder on Mangle Street. It turns out that Mangle Street has been the scene of other murders in the not too distant past. Grice goes to the jail to interview William Ashby, the unfortunate husband of the deceased, to determine if his story is believable. Unfortunately for William, his tale of the extravagantly dressed Italian with bright orange curly hair who bought a knife from his shop doesn't exactly convince Grice of his innocence. Even after the case seems to have been solved to Grice's satisfaction, March continues to investigate on her own. Her experiences helping her father, an army surgeon, are useful as her inquiries lead her to the morgue (among other unsavory places). The story is interesting, mostly for the two main characters. March is a thoroughly modern young woman, who doesn't hesitate to speak her mind when she feels she's right (which is most of the time). She is also mourning the death of her fiance, and recalls events from their time together throughout the story. Grice is totally devoid of any sort of sympathy or feelings. He comes to quick decisions based solely on his best interests and never deviates from them. He also has quite a few amusing scenes surrounding his glass eye and its refusal to cooperate as Grice would like. The only quibble I have with the story is the way everything was explained in one fell swoop toward the end of the story. The two main characters went around questioning and investigating (with more bodies turning up from time to time) and the explanation of the whole thing just seemed rather rushed in an effort to tidy up all the loose ends. Still, I enjoyed the characters and hope this will be a regular series.